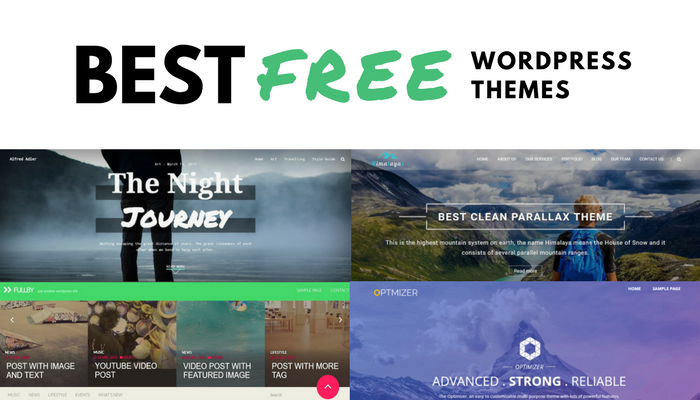 There are plenty of premium WordPress themes to choose from but the ones that are free usually lack key features and present a badly designed layout.This collection of the best looking free WordPress themes will help you pick the right theme for your WP blog or website without spending a dime. Fullby is the masterpiece work of Marchetti Design. It’s a free multipurpose theme for WordPress with a unique metro design. Fully’s free theme features include two custom menu – main menu and submenu. It also has a grid post layout that displays content in a fluid modular grid with special animations when resizing. The theme is completely responsive. It has widgets for popular posts and latest posts with a special featured content system. The theme supports video backgrounds and touch slide. It also allows custom logo uploading and advanced customization. Flash is one of the most feature-packed free WordPress themes that can be found online. It comes with the drag-and-drop page builder of SiteOrigin that simplified customization. The Flash Toolkit plugin allows the creation of multiple website sections with powerful widgets. The theme has multiple widget areas and custom widgets. It also has special section designs, including a service widget, a CTA widget, a client logo widget, along with custom team section and portfolio widget area. It also has a slider and an animated counter. Simple is a free multi-concept theme for WordPress created by Numbus Themes. Simple comes with a page customizer which is incredibly easy to use. It has special page sections for different content that can have either a static or a parallax image. The CTA section includes a neatly placed call-to-action button. The theme also has a clean About us page section and a Contact us section with a unique design that includes large-format social media icons. Love blogging? If you’re looking for a simplistic theme with an eye-catching design, Palmas is the perfect free theme for your WordPress blog. The page templates of Palmas include a blog layout and a home page design. Theme customization can be done with the help of the free WordPress customizer. The theme has a good use of white space and displays visual content in a beautiful way. The header has a gorgeous hand-made flower illustration and a clean menu with sans serif typography. 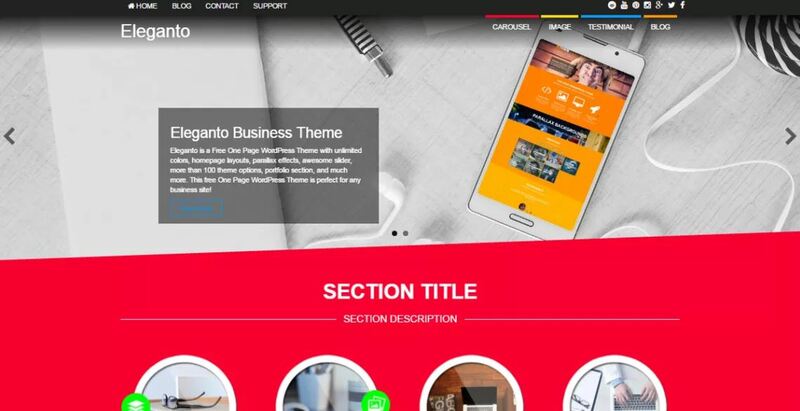 Eleganto is a free WordPress theme created especially with business sites in mind. The theme has a one-page design, a special portfolio layout, and awesome parallax image effects. The theme uses Bootstrap 3 and is completely SEO-friendly. Sidebars can be switched to either the left or right side and have five different sizes. The theme also has a slider section, testimony carousel and over additional 100 options. Himalayas is a free one-page parallax theme for WordPress with a gorgeous full-screen header image and a sleek layout design. The free version includes Awesome Slider and simple color customization options. The site also has a sticky header menu. The theme is translation-ready and compatible with WooCommerce. Mynd is a creative portfolio theme for WordPress that’s not only absolutely stunning but it’s also completely free. This retina-ready theme comes with a custom page builder and a fully responsive design. It has a one-click demo install and a sleek portfolio section with a grid layout. Briar is a beautifully documented free WordPress theme that’s also available on GitHub. The theme has a responsive layout, excellent parallax animations, and has full support for post formats. Briar uses the Bootstrap framework and can be customized with the WordPress customizer tool. Adler is a free WordPress theme that’s designed for bloggers and photographers. It has an eye-catching full-width header with a great typography design. It offers a simple chronology-based blog display format with large featured images and watercolor “read more” buttons. 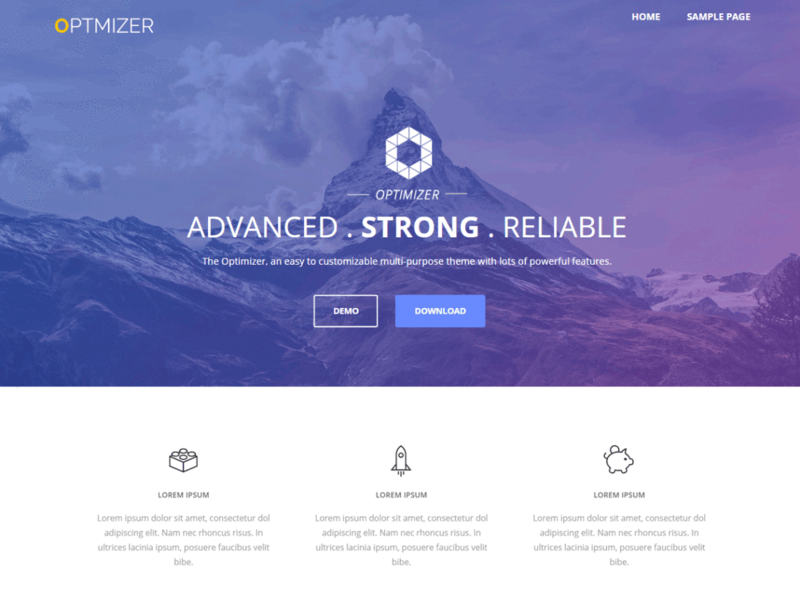 Optimizer is a free multi-purpose theme for WordPress with a stunning design. The theme supports Google fonts and has boxed and full-screen layout styles. It’s compatible with Mailchimp, WooCommerce, Contact Form 7, and it’s translation-ready.